One of the most popular sports during the spring, summer and early fall is golf, and there are several NC golf courses in the High Country area which allow pubic play. A few courses require a short drive but are well worth the time. For those who have never played golf in the mountains, you are in for a treat. Not only is the scenery absolutely spectacular at any time of the year, the cooler temperatures even in the dead of summer are quite moderate. It is rare that the temperature reaches the high 80s and there is usually a steady cooling wind year round. 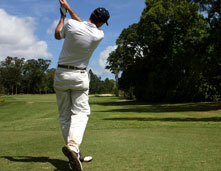 There are several North Carolina mountain golf courses available to play near great mountain real estate in NC. Let us help you with all of your Banner Elk Real Estate needs. Sugar Mountain Golf Course was designed by Francis Duane and Arnold Palmer and opened in 1973. This 4,650 yard 18 hole par 64 course has a 61.1 rating and a slope rating of 94. This is very well maintained golf course which placed a premium on a good short game and accurate putting. Beech Mountain Golf is located in the town of Beech Mountain, the highest incorporated town east of the Mississippi and is a great place for a round of mile high golf. Opened in 1969, it was designed by Willard C. Byrd. At an elevation of 5,506 feet, the views are spectacular on this 6,079 yard par 72 course. It carries a rating of 69.4 and a slope rating of 128 on blue grass. Boone Golf & Country Club is located in Boone, North Carolina and is an 18 hole 6,401 yard course which, while it is located on top of a mountain at an elevation of 3,266, it is a relatively flat track. It is open from April until November. The pro is a High Country legend, Sam Adams, a former touring pro and an all around great guy. Mountain Glen Golf Club in Newland is only a 20 minute drive from Banner Elk and is a semi-private course. This 6,723 par 72 course has a course rating of 70 and a slope rating of 129. Designed by George W. Cobb and is a very nicely maintained course located within a private community.